The Bernedoodle hybrid was developed by breeding Bernese Mountain Dogs and Poodles. The Bernese Mountain Dog originated in Switzerland while the Poodle originated in Germany and France. The Bernedoodle is a cross of the Poodle and Bernese Mountain Dog. As a result, the puppy’s size and weight can vary tremendously. Breeders may use standard, miniature or even toy poodles. Sizes range from: Standard – 23-29″ / 70-90 lbs. Miniature – 15-20″ / 25-49 lbs. Toy – 10-14″ / 10-24 lbs. Bernedoodles are known for the hypoallergenic properties of their coats. Bernedoodle coats are typically wavy and curly, which results in minimal shedding. Curly coats require frequent brushing to prevent tangles, as well as periodic trimming. Bernedoodles can range in colors, with the most common combinations being either black, black and brown, black and white, or black, white, and brown. Each Bernedoodle's appearance can vary because it is a crossbreed, meaning each litter has genetically different parents. Bernedoodles are extremely smart, loyal, and good in nature. They can be wary around strangers so it is important to socialize them as early in life as possible. Bernedoodles are extremely smart, loyal, and good in nature. They can be wary around strangers so it is important to socialize them as early in life as possible. Overall, the temperament of the Bernedoodle is playful and affectionate. They interact well with children and generally love to spend lots of time with their human families. Because they need to be in close and consistent proximity with their human families, you will find that they don’t do well when left alone for long periods of time. 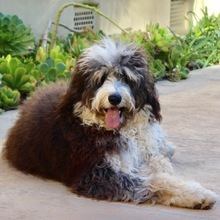 Bernedoodles make great family dogs because they are friendly and easy to socialize. A lot of intelligence is passed on from the Poodle parent, which allows the Bernedoodle to be able to work as a therapy dog, with the proper training. You can find Bernedoodle puppies priced from $200 USD to $5200 USD with one of our credible breeders. Browse through our breeder's listings and find your perfect puppy at the perfect price. Overall, the temperament of the Bernedoodle is playful and affectionate. They interact well with children and generally love to spend lots of time with their human families. Because they need to be in close and consistent proximity with their human families, you will find that they don’t do well when left alone for long periods of time. Bernedoodles make great family dogs because they are friendly and easy to socialize. A lot of intelligence is passed on from the Poodle parent, which allows the Bernedoodle to be able to work as a therapy dog, with the proper training. Bernedoodles require moderate maintenance. Because the Bernese parent contributes constant and seasonal shedding of all of the coat types, brushing your Bernedoodle a couple times a week is recommended. Bathing is recommended as needed. Bernedoodles have a minimal shedding rate for the curly and wavy coated canines but for the straight coated version, which is less common, the shedding rate is a little higher. Routine teeth cleaning, eye exams, and ear cleaning should be built into your regimen. When they are still young, Bernedoodles can be a little bit headstrong. Therefore, it is important that you start your Bernedoodle puppy with socialization and training early. Use a clear, strong voice with a kind, positive tone to train your Bernedoodle. They are very intelligent with an eager-to-please nature that makes it easier for them to be trained. It might take a few repeats of your instruction, but these pups are usually quick to comply with commands. Reward good behavior and obedience with meaty, bite-sized treats and lots of praise and encouragement. Bernedoodles are extra-sensitive to your tone and mood, so harshness will scare them into shying away from you. Bernedoodles are a moderately active cross-breed. Daily walking, play, and interaction is recommended. Their natural gait is a slow trot, so walking a Bernedoodle should be easy for most people. Bernedoodle Puppies for Sale - Shipped Worldwide! Finding the right Bernedoodle puppy can be dog gone hard work. PuppyFind® provides a convenient and efficient means of selecting and purchasing the perfect Bernedoodle puppy (or Bernedoodle puppies) from the comfort of your home, 24 hours a day, 7 days a week. Take advantage of our PuppySearch or leisurely browse our directory of hundreds of dog breeds, Bernedoodle dog breeders, Bernedoodle dogs for adoption, and Bernedoodle puppy for sale listings with photos and detailed descriptions. Some Bernedoodle puppies for sale may be shipped Worldwide and include crate and veterinarian checkup. Many Bernedoodle dog breeders with puppies for sale also offer a health guarantee. With thousands of Bernedoodle puppies for sale and hundreds of Bernedoodle dog breeders, you're sure to find the perfect Bernedoodle puppy.